Bok choy chicken soup noodles is a comfort food meal made in an Instant Pot. Make this easy and quick pressure cooker Asian chicken noodle soup recipe in 30 minutes with minimal preparation! This homey bowl of Pressure Cooker Bok Choy Chicken Soup Noodles is so comforting to eat. We love our pressure cookers and are CRAZY about delicious food!! We enjoy spending hours researching, testing, and tasting recipes together in our kitchen. Thanks Barbara for having us here and thank YOU so much for dropping by! If you are new to using a pressure cooker, be sure to check out Barbara’s great post on getting started with an electric pressure cooker. Today, we’re thrilled to share this new easy Instapot noodles recipe with you. It may look like it’s just an ordinary bowl of noodles. But to Jacky, it’s a totally different story. Every mouthful of this al dente noodles with a spoonful of chicken fragrance and flavors, remind Jacky of his Dad. His family sent him away to study abroad when he was only 12 years old. He wasn’t even a teenager yet! He didn’t speak the language, didn’t know the culture, and he didn’t know anyone. He was really homesick. 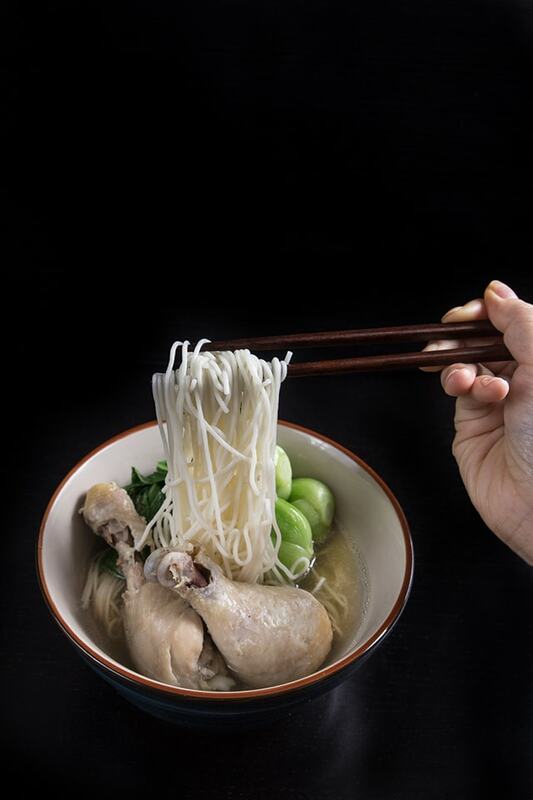 One of the things he missed the most was this soothing bowl of bok choy chicken soup noodles. His dad used to make the noodles for him every week when he was still with his family. Jacky never got to taste this bowl of noodles from his dad again. In fact, he has never seen his father again since he left his hometown at 12 years old. He went searching. Searching for years to find that particular texture and flavor from the bowl of Asian noodles his dad once made for him. It was his way to relive the good memories, his way to reconnect with his dad. We finally found this simple combination to be the one. Yes. The moment this bok choy chicken soup touched his taste buds, his memories of childhood came flooding through his mind. “This is it!“ he excitedly repeated three times. This heartwarming moment was like finding this precious old family photo that was hidden right under your bed. So, don’t expect big flavors from this soothing bowl of noodles. It’s a taste of Jacky’s childhood, a taste of a father’s love for his son. An Instant Pot is one of the most popular brands of electric pressure cookers. 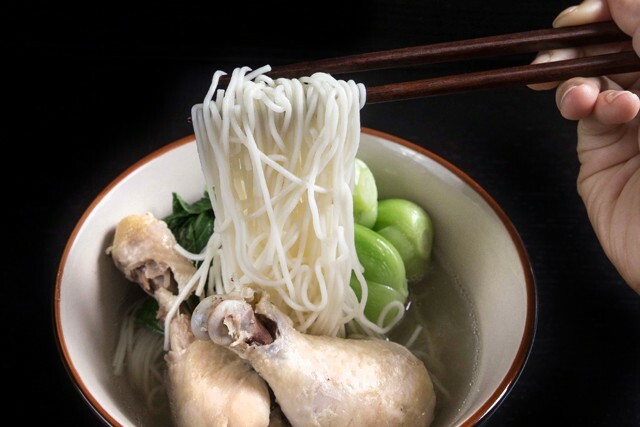 They are easy to use and your Instant Pot can help you create this delicious Bok Choy Chicken Soup recipe! The combination of Chicken and Shanghai Bok Choy in this recipe is the base of many Chinese dishes. We’ve tested the recipe with frozen chicken drumstick to see if it works. It’s not necessary to use frozen chicken drumsticks. *If you like, you can complicate the flavors by adding some soy sauce, garlic, and onions. But we just wanted to keep it simple. Small chicken drumsticks: High Pressure for 8 minutes, then Natural Release. Larger chicken drumsticks: High Pressure for 10 minutes, then Natural Release. Always check with a meat thermometer to ensure the chicken is at 165° Fahrenheit (75° Celsius). In the meantime, boil 1.5 quarts of water in a medium saucepan. Cook the noodles for 3 - 4 minutes over medium high heat. Run them under cold running tap water to avoid overcooking. When the pressure cooker has been fully natural released, open the lid. Remove the chicken and set aside. At this point, the concentrated chicken stock mixture will be very salty. 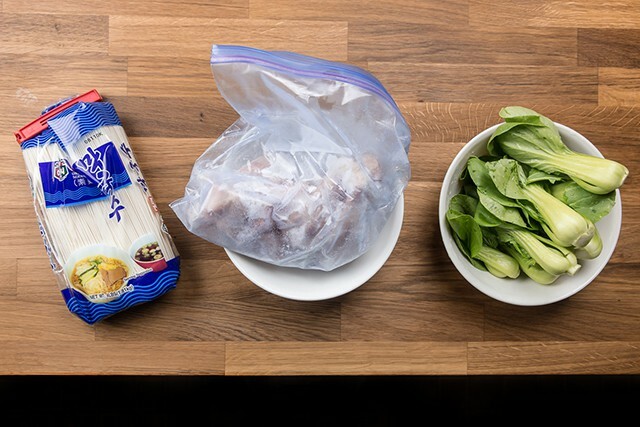 Submerge the Shanghai bok choy into the boiling chicken soup and turn off the heat. Close lid and let the leftover natural heat cook the bok choy for 1 – 2 minutes (Do not overcook the bok choy. They should not be completely tender). Serve with the cooked noodles in the chicken soup! If you cannot find Sōmen 素麺 from your local supermarket, feel free to substitute with Conchiglie (Shell pasta) and Macaroni. These are very popular in Hong Kong Style cafes. Best Pressure Cooker Pot Roast Cooking Time Experiment – It’s so confusing! 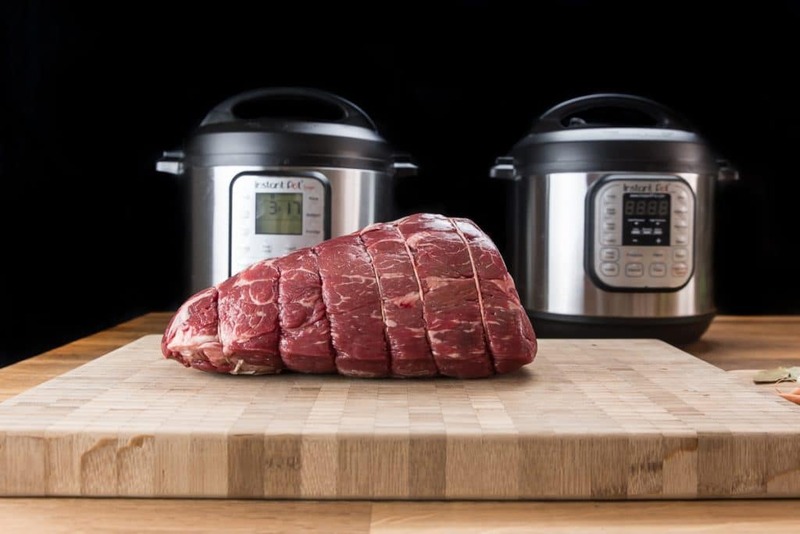 How long should we cook Pot Roast in the pressure cooker? 20 minutes? 45 minutes? 75 minutes? 90 minutes? Or ??? We did a little experiment to discover the BEST Pot Roast cooking time. 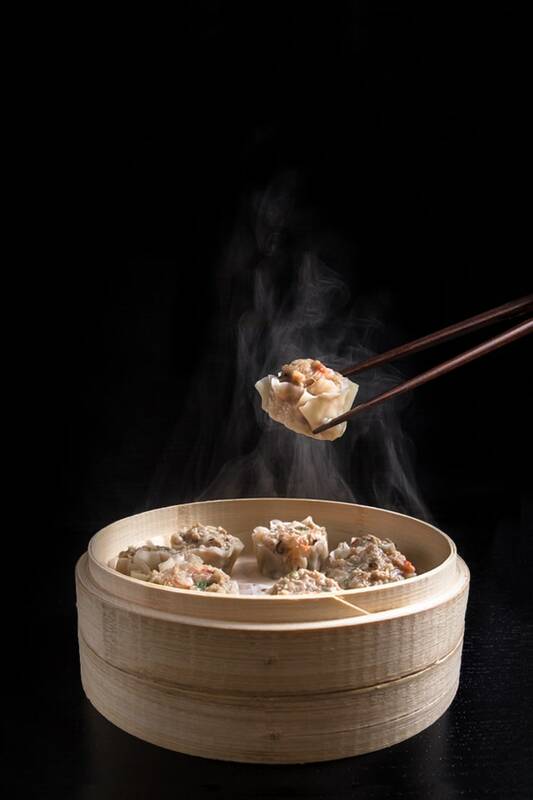 Shumai Recipe (Shrimp & Pork Dumplings) – Make these bite-size goodies right at home. They’re great for make ahead freezer meals! Hi. Forgive me for asking such stupid question as I am very new to cooking using a pressure cooker. When you said “Turn on the heat, pour 3 – 4 cups of hot water or homemade unsalted chicken stock into your pressure cooker and bring it back to a boil. ” Which button do I choose ? Hi Jeff – depending on the brand of pressure cooker you use – on an Instant Pot select saute to bring it to a boil, or if your brand doesn’t have a saute button, you would use a pressure cooking button, such as meat, without the lid on to bring things to a boil or saute or brown. Enjoy! Can i just add the uncooked noodles when the soup is done? I would like to skip any unecessary steps and make this a one pot meal. It is always better to cook the noodles in a separate pot as the noodles will slightly alter the taste of the soup and make the soup cloudy & starchy. When you remove the chicken, it states add chicken stock/water and check seasoning to see how much 3 -4 cups water or broth to add? Not clear. Does the taste determine the amount (3-4) you use? Looks like a great recipe and cant wait to try it. Hi Josie, thank you for your question. What a heart felt story! And what a great bowl of food to go with it. Thanks for sharing! Thank you for your kind words Marci!!! Awe! I’m glad to hear the story behind this one. Truly, this is comfort food for Jacky. I’ll be sure to give this one a try! A heartwarming story and a soulwarming soup, thank you for both. Give Jacky a big hug. Jan, thank you for your kind words.